I needed a little "makeup pick me up" recently and Marc Jacobs Beauty See-quins Glam Glitter Eyeshadow really pulled through! 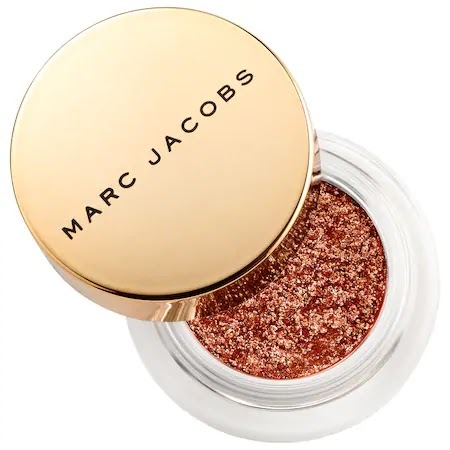 Marc Jacobs Beauty See-quins Glam Glitter Eyeshadow is a glitter packed eye shadow like none other. It's a sequin effect eye pot eye shadow that adds the perfect amount of super shimmer to any eye look. It's extremely dense pigments allow for the glitter to glide over the eyelid with maximum sparkle using just a touch of product. 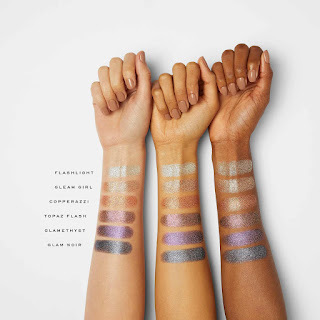 If you really want a high glam or stage look you can layer it on for an intense glitter look, or use a tap of your finger for a soft wash of sparkle. There are six shades in the collection and my favorite is COPPERAZI (Pictured, above. I love the name!). I loved adding a touch on my inner corners or over the lid for a night time look. The COPPERAZI shade was very flattering to my eyes and my skin tone. It's one of the most beautiful copper shades I've ever used because of the warm tones blended with the hot pink glitter that really catches the light. I liked applied either with my finger or a eye shadow brush like the Marc Jacobs Beauty The All Over Shadow Brush Synthetic. There was no fall out and the application was completely smooth and even. Marc Jacobs Beauty See-quins Glam Glitter Eyeshadow worked well directly on my lid, as well as over powder/cream eye shadows. The See-quins Glam Glitter Eyeshadow stayed for hours and hours with no fading, smudging or transfer, no creasing and the glitter didn't fall out even by the end of the day. Note: Because of the high level of pigment and glitter in See-quins Glam Glitter Eyeshadow, you must use a heavy duty eye makeup remover before cleansing your face at night to remove it. Two other beautiful Marc Jacobs Beauty See-quins Glam Glitter Eyeshadow shades I fell in love with are Gleam Girl and Topaz Flash (both shown, above).